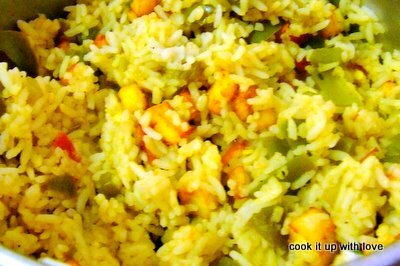 For those who love the taste that arises from a combination of capsicum and paneer, (as in paneer tikka), this pulao will definitely tickle your palates :) Go ahead and try it ! 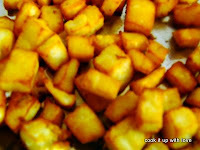 Fry the Paneer cubes in oil or ghee such that it becomes golden brown as shown below. Set aside. Now boil the rice with 2 cups of water, and then set aside to cool. Make a puree out of tomatoes and capsicum together with fennel seeds. In a pan, heat 2 spoons of oil, and saute the puree of tomatoes and capsicum in it. Add salt, garam masala powder and dhania powder and mix well. Let the puree cook for around 5 minutes. Add around half a cup of water. Now add the fried paneer cubes. Finally add the boiled rice and mix well. Top with steamed capsicum pieces as well as some chopped coriander leaves. Serve hot with raita or tomato sauce. This entry was posted in Rice Recipes . Bookmark the permalink.